Tava Pulav is one of Mumbai's famous street food. For under Rs.100 ($2), you get a fabulous meal (of course, the oil and grease notwithstanding!!). 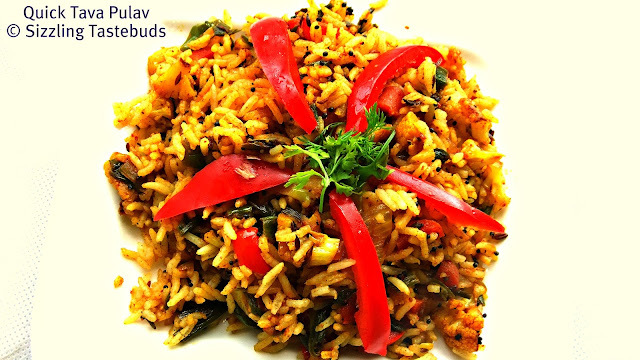 Today, I have made this Tava Pulav in a quick-to-make version, which hardly takes 10 mins if you have the cooked rice on hand and the veggies chopped. Now, that's quick right ? The choice of vegetables is totally upto you. I usually add most of the seasonal veggies,taking care not to add tomatoes or any other water-based vegetables, lest it turns soggy. 1) Soak and cook rice till done. Fluff up the grains in a large plate and cool slightly. 2) In a large skillet (or tava), heat oil. Splutter cumin seeds. 3) Fry onions till they slightly brown. 4) Add the chopped veggies and saute. Made them for yesterday's lunch and the follow the same way too. Well done. Heard a lot about this pulao, shud try this out soon..
Kalyani..this needs a blob of butter! !...and..wow..my mouths watering..have u ever had this tawa pulao at Santa Cruz..there is a stall ..this guy starts after midnight and is on till 5 a.m!! very nice! vibrant colors too! O wow, I swear I thought you went to VT and click the pic of the Tawa Pulao they serve there. It looks good! very delicious n inviting pulao...nicely done!! thanks for this wonderful entry.. 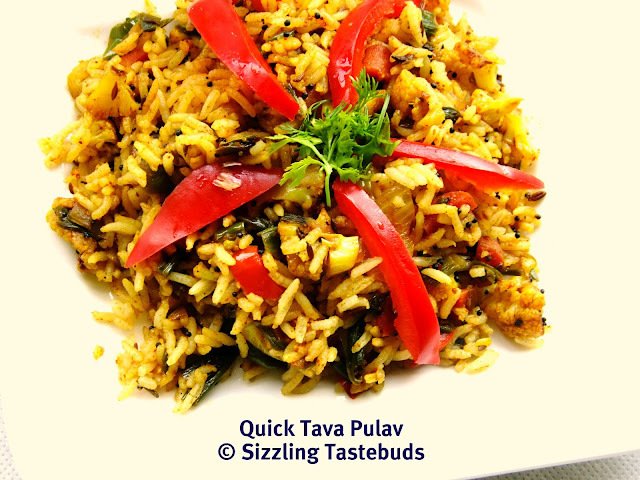 I have heard of tawa pulao never tried it. Lazy bones I guess. Will surely try this. Made this a while ago and this is the best tava pulao I've ever tasted. Thank you for sharing this recipe Kalyani!